Exciting times at Clare Florist HQ today as we proudly unveil the latest addition to our range of fresh flower bouquets. The Oriental Charm Bouquet has been specially designed to evoke the enigmatic beauty and allure of the far east. Featuring an assortment of fresh lilies, carnations and roses, this vibrant new arrangement comes inclusive of a free 96 gram box of Thornton's chocolates! 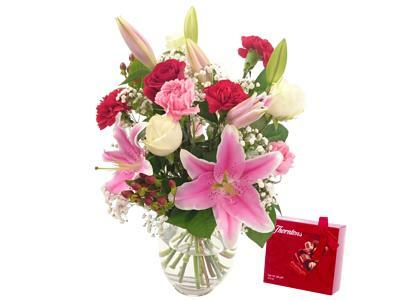 Every order of the Oriental Charm Bouquet with Free Chocolates includes free next day delivery. Your flowers will be delivered by courier in our signature flower delivery box which has been designed to ensure your exquisite floral gift arrives in absolutely immaculate condition. This new bouquet chocolate combination is perfect as a gift for loved ones or can also be used to decorate your own home with the delicious chocolates an added treat for yourself. Order now for free standard next day delivery or you can arrange Saturday or Sunday delivery for a small surcharge. Let us know what you think about the new bouquet, we're keen to take on board any feedback you might have!